This picture was taken on top of Lookout Mountain overlooking the Tennessee River, which is snaking itself around the base of the mountain and the city of Chattanooga. I don’t know if this balanced rock is in Tennessee or Georgia. The state line splits the mountain somewhere nearby. I like this picture because it is in-your-face and good composition. The family sitting on the rock is the Wright family. The picture was taken in 1931. The lady sitting next to the end on the right side is Lila Wright. She was Anna’s grandmother’s sister. She used to own a country store on Canton Highway in Marietta. I used to see her at family gatherings. 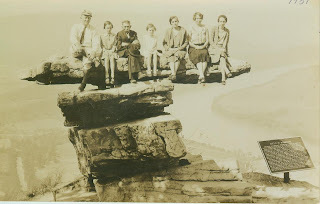 The elderly man on the rock is identified as Grandpa Wright. I assume it is Lila’s father and Anna’s great grandfather (Tammy – if you are reading this, your great-great grandfather) Henry Gable Wright (1857 – 1936). That means he was about 74 in this picture, on top of a balanced rock overlooking the Tennessee River… not me! Eddie, that is a REAL keepsake!! What a great photo. I am going to link to it. It is in-your-face unusual isn't it? Kenju and Judy are right. I wonder if its still around? Judy Kenju is always right! I remember climbing in the 50s, and I came across a picture of Anna standing in front of it in the early 60s - and that is the last I heard of it.